By automatically generating correct-by-construction constraints from the RTL for a design we shorten the time and effort required to perform this task. We ensure consistency in how constraints are written by geographically dispersed teams with varying levels of SDC expertise. Our best-in-class exception generation identifies exclusive clock groups, false and multi-cycle paths based on the functionality of a design. These exceptions to single-cycle timing typically provide a 1-3% reduction in area and power consumption. They almost always provide a dramatic reduction in the number of paths that do not meet timing at the end of P&R. We are able to significantly improve P&R runtimes by generating clock-sense stop-propagation constraints that reduce the clocks/register on a design without impacting QoR or changing timing results. As part of the SDC generation flow we automatically run SDC verification to critique the quality of the generated constraints. We allow engineers to generate assertions for the timing exceptions extracted by the tool, allowing these exceptions to be verified using third-party simulation tools. 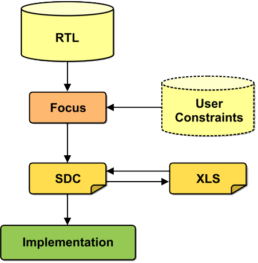 FishTail’s SDC generation solution reads the RTL for a design, and from just that information, we generate the clock definitions, input-output delays, clock groups, clock senses and timing exceptions for the design. Optionally, the tool can also be asked to identify the modes on the design and the case analyses that put the design into a specific mode. We also generate .lib models from RTL and these models are used for design budgeting while the implementation of a block is still in progress. The constraints generated by the tool are verified using our SDC verification solution. Several engineers raved about Fishtail's Focus product, which can read RTL and detect multi-cycle and false paths in a design. We are enthusiastic in our endorsement of FishTail’s products for the generation of timing exceptions. Our detailed study has clearly shown that the use of FishTail exceptions in the chip-implementation flow will provide substantial improvement in design QoR and TAT. With our design team, the timing of the multi-cycle paths and the timing relationships between clocks is only in designers' heads. We have to have the person who does the static timing analysis talk to the design engineers to find these things out. Focus, in contrast, points out the false and multi-cycle paths, thus allowing timing analysis and closure in a "more formal way. We use Fishtail Focus for almost all of our designs. We find that the quality of the netlist improves dramatically when the exceptions generated by Focus are used. Fishtail's Focus tool quickly found all multi-cycle paths and false paths built into my mixed-HDL evaluation test RTL. In addition, it found an multi-cycle path that I had not considered, but after examining further, found to be correct. If a design has a chance of meeting timing at the target clock speed then the Fishtail exceptions will get it over "the hump" and save time and effort that would need to be spent to manually get the design to timing closure.